Ramble n. A going or moving from place to place without any determinate business or object; an excursion or stroll merely for recreation. What started with a block party, a bike parade, some art and music and an invitation to the community to do anything they wanted has blossomed in its 5th year into a veritable free-for-all! Ask Old Northender’s what they want to put on the Ramble Map & Guide – how they want to participate in a celebration of creativity and community in their neighborhood - and you end up getting to play croquet, be in a parade, compete in North versus South Field Days by running with hula hoops, see live music from noon to dusk, be live on CCTVs soapbox, enter a raffle to support ONE schools PTOs, browse local art galleries and studios, go to BBQs and yard sales, bring your kids to storytime and the list goes on! This is truly a community driven event. The Old North End invites you to come and see what we have going on in our neighborhood. I guess you could say it’s the Old North End’s day to show off! Pick up your map and head on over. 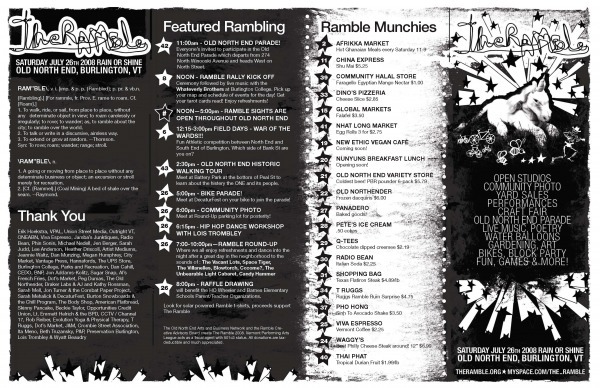 We’ll see you at the Ramble! 11:00 a.m.--Everyone's invited to participate in the Old North End Parade which departs from 274 North Winooski Avenue and heads West on North Street. Noon – Ramble Rally kick-off ceremony, followed by live music by the Whateverly Brothers, will take place at noon at Burlington College. Pick up your map and schedule of events for the day! Get your tarot cards read! Enjoy refreshments! 5:00 p.m BIKE PARADE!. Meet at DecaturFest on your bike to join the parade! 8:00--RAFFLE drawing will benefit the HO Wheeler and Barnes Elementary Schools Parent/Teacher Organizations. Ramble T-shirts will also be available, with proceeds to support The Ramble. 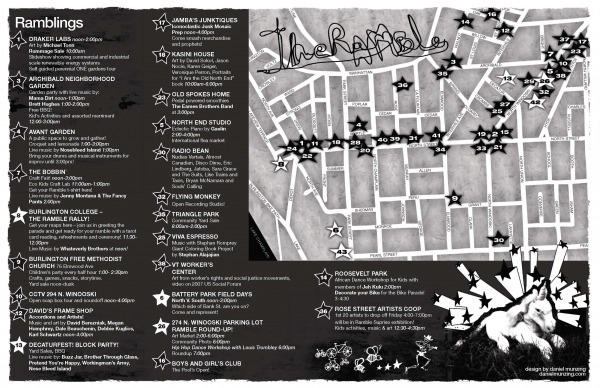 The Old North End Arts and Business Network and the Ramble Creative Advisory Board create The Ramble 2008. Vermont Performing Arts League acts as a fiscal agent with 501c3 status. All donations are tax-deductible and much appreciated. Maps and guides can be found at area businesses by Thursday July 24 and will be available at the event. It is recommended that you bring your bike to get around the neighborhood and be in the parade! For more info, to volunteer or donate, please e-mail the ramble, check our website at www.theramble.org, or call Heather Driscoll at 355-6155.